CMP450 - A submersible, very rugged, heavy duty lapel speaker microphone for the HX series hand portable radio. The CMP450 is attached with a revolving clip and allows the radio user to carry the radio on their belt and have the facility to both make and receive calls without removing their radio. This keeps the radio safe and ensures that calls are not missed, especially in noisy environments. 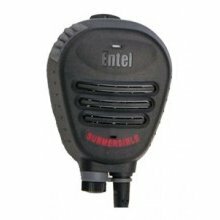 The CMP450 has a socket (3.5mm mono) to allow an optional earpiece (EHP9) for discreet reception of calls. Note: When the earpiece is attached the speaker microphone is no longer submersible, until the earpiece is removed and the waterproof cover is replaced and tightened.